We found Portsmouth to be a very interesting place. 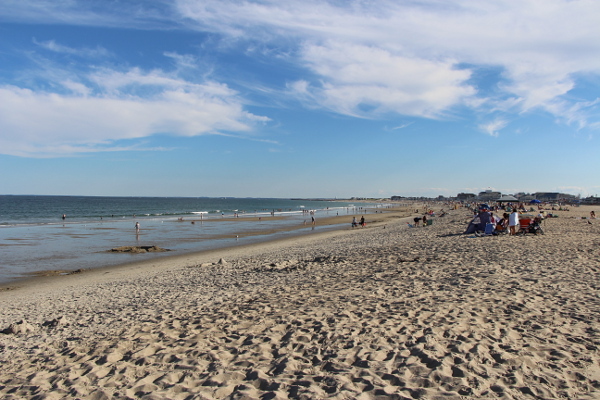 And as residents of an area trying to build the type of vibrancy that they seemed to already have, it was difficult not to compare and contrast Portsmouth with the Hartford area. 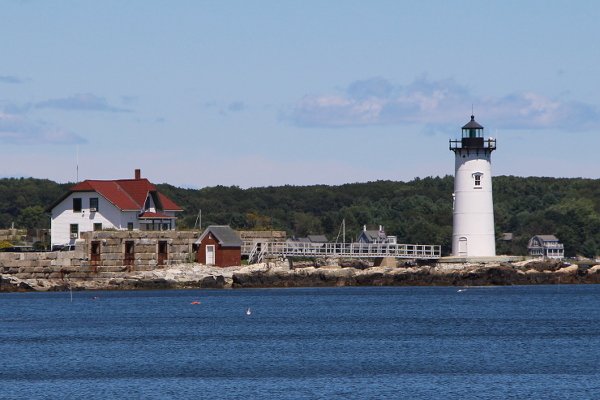 For background, the City of Portsmouth proper is only 15.6 square miles and has a population of about 21,000. This is about the same geographic size as our municipalities, as the City of Hartford is 17.3 square mile with 125,000 people and West Hartford is 21.9 square miles with 63,000 people. 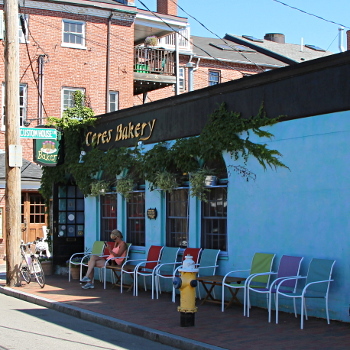 We spent most of our time in Downtown Portsmouth. That’s where our hotel was, and that seemed to be the center of activity – shops, restaurants and attractions. Downtown has a critical mass of stuff, and we’re guessing it’s attracting people from the neighboring towns since there didn’t appear to be enough housing Downtown for all the people we saw out and about. There were a lot of tourists/visitors there, but it wasn’t clear why they were in town. Many (like us) were there for the local beaches. Others staying in our hotel were there on business. But unlike visiting Downtown Hartford during a big event, it was not obvious why they were there. 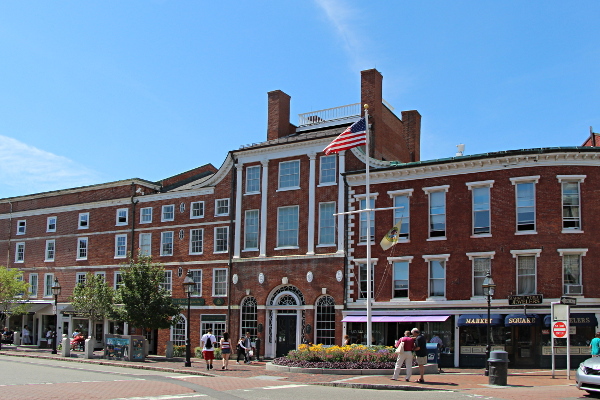 In terms of geographic size, Downtown Portsmouth is about the same size as Downtown Hartford. Both have many street blocks while remaining very walkable. My unscientific way of measuring is that I can get the most interesting parts of each Downtown into a single screen at the same zoom level of Google Maps (Portsmouth, Hartford). If anything, Downtown Hartford is a bit bigger. In terms of building scale, Downtown Portsmouth is about halfway between Downtown Hartford and West Hartford Center. Most buildings are mid-rise structures (generally 4 levels or fewer). There are no skyscrapers (as there are in Downtown Hartford), but there are also very few single level buildings (as are common in West Hartford Center). 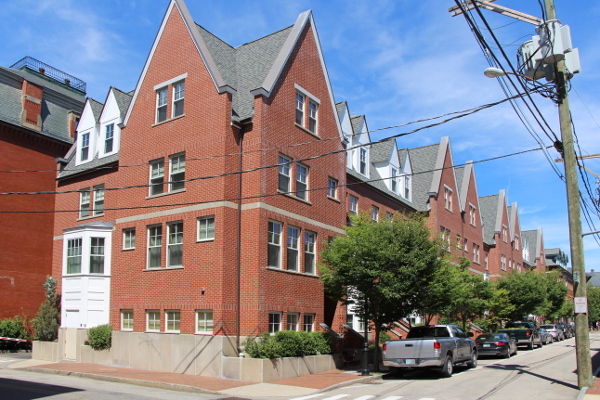 There are very few super-blocks in the active part of Downtown Portsmouth. Most of the blocks were small, with multiple buildings on them. 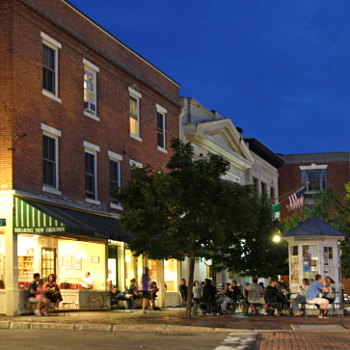 Downtown Hartford, and to a lesser extent West Hartford Center, have numerous examples of a single structure occupying entire blocks (or more). Highway access to Downtown Portsmouth is very good. I only recall seeing one public garage in addition to the on-street parking. I do not recall any surface parking lots in the Downtown core itself, though I see online that there are four. There is bus service in town, and it looks like they have their own Downtown loop route – like the Hartford Star Shuttle. Portsmouth is charming. The historic buildings are interesting to look at, and because there are so many of them they define the look of the town. It is an attractive place to visit. Every space was utilized. There are some hills in Downtown Portsmouth, so you see buildings where there are walkout basement levels around back on a little side street/alley. They were almost always finished spaces that were shops, restaurants, or apartments. 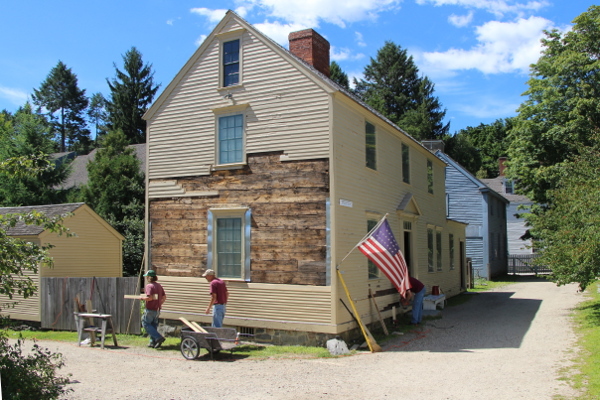 Their main museum (Strawberry Banke) is Downtown, making it very accessible for visitors. They were the only game in town. There did not seem to be any other downtown areas competing for the attention of locals or visitors. There were big malls, and there is outlet shopping. 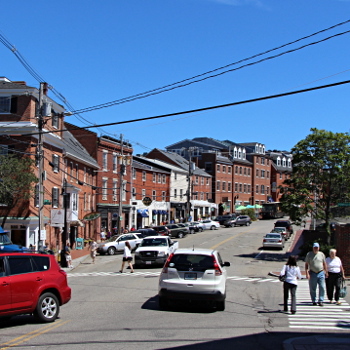 But if you want an urban feel in that part of the country, then Downtown Portsmouth appears to the be only option. There were few national chain stores or restaurants. This was very surprising to us, and we’re not sure if it’s because chains don’t see opportunity in Portsmouth or if the locals discourage chains from entering the market. 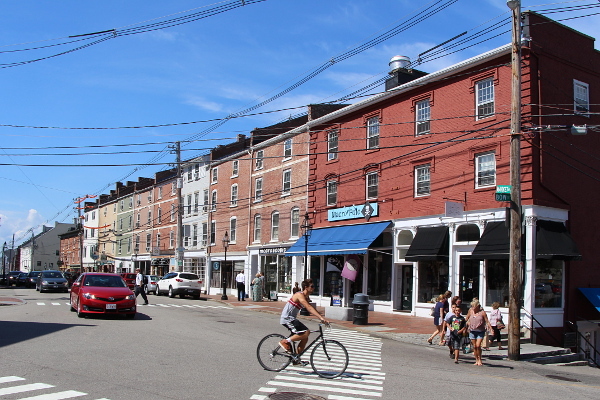 Either way, the dominance of local shops makes Downtown Portsmouth even more attractive since it’s a different experience than going to the mall. Our main takeaway is that Portsmouth has done well for itself given its location, size and history. It has its challenges (economy dependent on cyclical military spending), but it has been consistent in prioritizing history as a core asset to build around. It’s a fun place, and we will likely go back to visit again. Downtown Hartford is much larger than Portsmouth and the two aren’t really comparable. However, we have many of the same types of complementary attractions, and may be able to learn from them. They have a summer tourist season due to their coastal location. We have visitors coming to town year-round for events at the convention center. 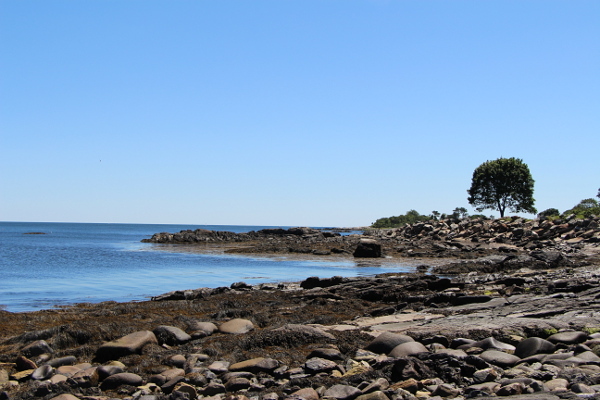 They have a modest park on the water, we have a park along the water and a much larger park integrated into Downtown. They have one main museum, we have multiple signature attractions. The main difference we see is that Portsmouth is a complete and integrated economic system that can easily handle the ebb and flow of visitors. Downtown Hartford sees much larger surges of visitors. When we’re prepared and geared up for it, everything goes smoothly and our guests enjoy the City. But at times it seems like the visitors overwhelm the system. Hartford projects that are under discussion should improve our baseline economic activity. More apartments and the proposed UConn campus will boost demand for goods and services in Downtown Hartford – many of the same things that visitors need. The iQuilt project is already helping guide visitors through the City to the various attractions. Hartford seems to be taking positive steps. We have the potential to evolve into a unique Downtown environment that is not only a mixed use neighborhood, but also regularly draws in (more) visitors from surrounding towns. Once we get the baseline activity up to a critical level, we will hopefully see a snowball effect and see development projects that don’t rely on subsidies to be viable.